During the summer of 2014, inspired by the blogging of fellow KY teacher Patrick Goff, @BMSScienceteach, the #NGSSblogs project was born. Our goal was to use a thoughtful approach to NGSS implementation where collaboration with others is key and support is ongoing. By fall, we had the framework of the project in place and an invitation for others to put reflection into action and build NGSS capacity through blogging and sharing. It is with great gratitude for those initial bloggers who by sharing their blogs, made their thinking visible to others to support them on the path to understanding the NGSS. In December of 2014, an idea that I had become my passion project since the summer with the support of Melissa Ferrell became a US DOE Teach to Lead project. Our team designed the framework for a Multi-Tools Online Community to support NGSS implementation (MTOC). The #NGSSblogs project became our whole-community Passion Project. At the start of 2015, we relaunched the #NGSSblogs project after evaluating and discussing the fall exploration phase. I am so appreciative of the opportunity to read the reflections and learn from so many amazing educators nationwide. The tremendous scope and diversity of perspective provided a rich tapestry of ideas. Built into this iteration of the project was a focus on Collective Conversation through retweeting, commenting and providing feedback on the blog’s of others as well as the reflection of writing and sharing one’s own blog.This phase of the project encouraged us to consider categorizing the blogs to support the great learning potential for all that results from seeing the thinking of others as they work to translate the NGSS into instruction. As I reflect on the last 331 days since the birth of #NGSSblogs, I am so lifted and inspired by the educators who have committed to doing this incredibly important work: building their capacity, reflecting on their practice, and contributing to the collective conversation through blogging. The passion of this group of edubloggers is unmatched and their service to the profession is exemplary. Thank you to the 2014-15 #NGSSblogs contributors. Thank you to the MTOC Team for leading this work and constantly looking at feedback and data so this project can continue to grow and improve. 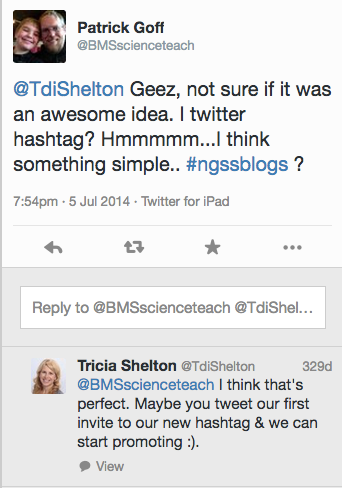 Check out the #NGSSblogs hashtag on Twitter. Such a great list of wonderful new explorers to follow. My only regret is that I did not find this a year ago! What a profound approach you are taking to NGSS, I’m impressed. We have designed a curriculum for NGSS which addresses an area which if often overlooked, the youngest three grades. Have you taken a look yet at curriculum for NGSS? Have you looked at Science4Us ?